I was wondering if folks could help me out with a list of what games have a game controlled ball gate that diverts the ball back into the shooter lane. It's usually EM games that come to mind for me, but I would guess their might be some SS games also that had this feature also. TIA. My Bally Sea Ray has this feature. not a ball gate but Star Trek has a flipper you can raise that opens a path to the shooter? The Defender pinball machine has one. Space Invaders has a drop target that protects a way back into the shooter lane. There's no gate there.... Just an open hole. SM can be converted to do this. A great way to probably get 90% of your list in 10 seconds is go to ipdb.org. Go to advanced search. Type 'outlane gate' into the notable features search field. No, it just diverts the ball from out lane to in lane. Not shooter lane. My Williams "Post Time" has one of these. dolly has a passthru, no post computer controlled or otherwise. I thought of that...yet when you look at a game that has this feature on IPDB (ex: Defender) the feature isn't listed. Look at another game that has the feature (ex: Sea Ray) and it lists it as a "Right outlane ball return gate" yet only the word "gate" is highlighted as a link. I was trying to look for a link for that feature instead of searching the term in the advanced search. When I do search what you suggested there are some not listed (as Defender is missing) and the others seem to be 50/50 if the gate in question is diverting the ball to an in lane from the outlane or to the shooter lane from the outlane. So doing that search isn't quite as easy as you made it sound. It seems that a lot of people were confused by the question. I mean a way to get the ball back to the shooter lane by means of a gate that is either opened or closed by the game by completing a certain game goal. So TWD and ST are out. They are just shots to the shooter lane. I honestly can't think of any DMD games that has a gate that does it. Not what I had in mind, but that look like a cool feature in a game. So do you qualify something to allow the ball drain to kick it back up to the playfield through the flippers or is it a timed thing like a ball save on a modern game? 1989...that's newest game I have seen listed with this. UPDATE: It looks like Capcom's Airborne is newer. It's the only DMD game I have seen that has the gate that diverts an out lane ball back to the shooter lane. Space Time/ Time Zone and Ro-Go! have 2 gates that do. And also don't show up with the IPDB search. Bally's Dixieland. I would love to play that one again. Does hook and bbh not qualify for this? last time i played them they both had game controlled gates back to the shooter lane. What has made me ask this question is that is seems that these types of gates (and ones that change an out lane to an in lane) were highly prevalent in older games yet the last one I can see being used was for Capcom's Airborne in 1996. It's the only DMD that I have seen this feature. The next newest seems to be Bone Busters that crassmage mentioned. I started another thread that describes a game feature that I don't believe has been used that I think would be a lot of fun using this type of gate in a game. Hook, I don't know, but from the pictures and what I remember of playing....no. At least not what I originally had in mind. Big Buck has some way to get back to the shooter when the critter on the right is sticking out, but I was meaning more of a gate that is activated and saves a ball from draining in the out lane, by sending it back to the shooter lane. I should have been more specific, but I didn't think of all the games where you could just shoot for the shooter lane. Hooks gate is located on the ramp above the right inlane/outlane so it wouldn't qualify. 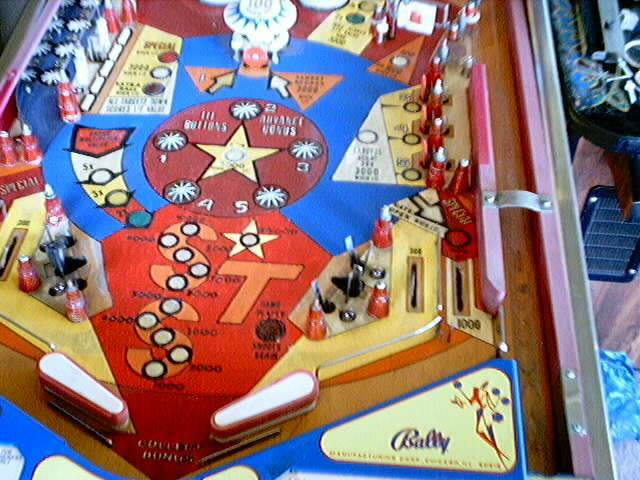 i think its only activated during certain modes or multiball, i have my game on route and can't remember exactly how it works. Hooks gate is located on the ramp above the right inlane/outlane so it wouldn't qualify. i think its only activated during certain modes or multiball, i have the game on route but can't remember exactly how it works. OK...I see it at the end of the ramp. It looks like instead of dumping in the right in lane it sends it to the shooter. I've only played it a couple of time and I didn't even notice the diverter there. I'm guessing I never had it activate on me.